Lily's owner could no longer care for. She was Spayed and has since been adopted! 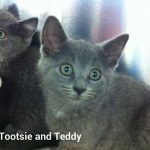 Teddy and Tootsie's mom was a pregnant stray. 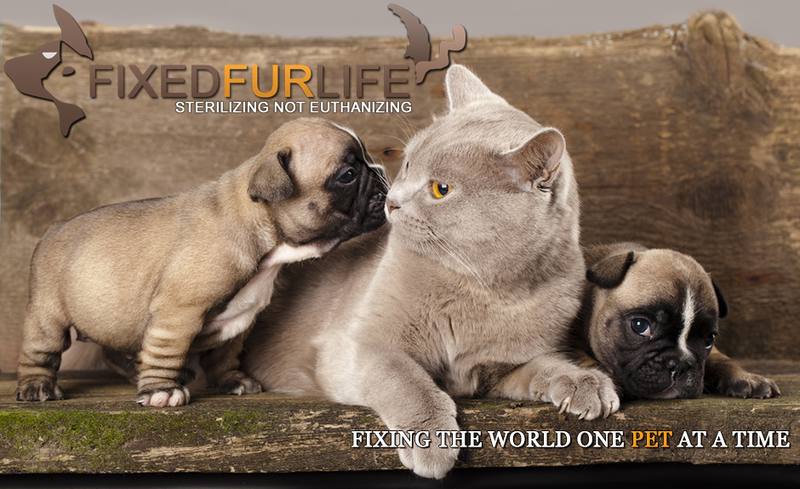 Taken in by Fixed Fur Life they were treated for several infestations. They were adopted finally together! These 14 Babies were surrendered from a barn population. After months of being treated x 3 for a number of infestations they were finally well enough to be adopted! All have now been Spayed and Neutered as well! 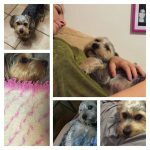 This sweet little guy came to us as an owner surrender.. Infested with fleas and sporting many open area's on his legs and underside. After months of rehab he was finally well enough to be neutered and adopted! 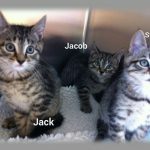 Jack Jacob and Swayze all came to Fixed Fir Life as stray kittens. All have been adopted! 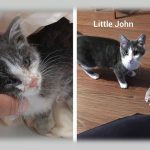 Little John came to Fixed Fur Life as a malnourished little boy. Treated for many infestations and bloomed into this beautiful little man. Neutered and now adopted! Our mom was hit and killed by a car when we were days old. 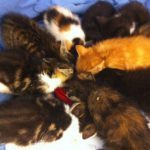 We into foster care for Bottle feeding. We have all been adopted! 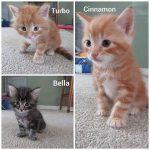 Turbo, Bella and Cinnamon came to Fixed Fur Life. 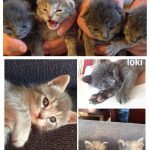 Their Mommas was a pregnant stray. All have been adopted and Momma Spayed! 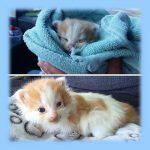 This little munchkin is only 2 weeks old and was found in the middle of a road. Bottle fed and has gone on to his new home! 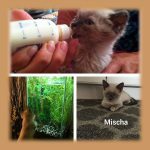 Mischa came to Fixed Fur Life with her siblings as wee babes who were orphaned. Bottle fed all 3 did very well. Once weaned Mischa was adopted. Shown here in her new home! 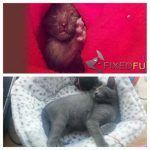 Squirrel came to Fixed Fur Life as a tiny orphan. Born outside in frigid temperatures he was the only one to survive of his litter. Bottle fed he progressed well. He was adopted and is shown here in his new home! 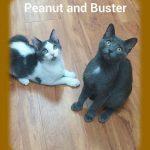 Peanut and Buster were born behind the Dairy Queen in Trenton. Taken in and socialized they eventually found a home together. 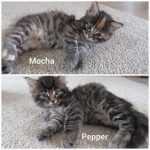 Both were neutered prior to adoption. Over a year ago we assisted with the vet care for this little guy who had an injury and needed an amputation of his front leg. We were contacted recently that owner could no longer care for so we set out to find him a new home. Shown here in his new home! 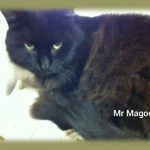 Mr Magoo was left on the riverside trail with a bag of food many many months ago. 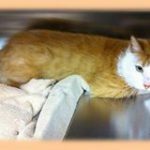 He was un neutered, had a raging urine infection, crystals in his urine and was infested with fleas. Finally all his issues have resolved post treatment and he FINALLy went on to his new home!! We are going to miss you but know you will be happy in your new home. 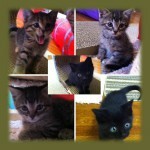 Anastasia, Arabella, Annabelle, Jags and Jasper were all adopted! 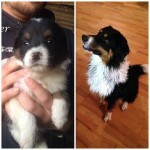 Tucker was one of a litter of Pups born on a farm. The owner surrendered to Fixed Fur Life. Mom was Spayed and Tucker and his littermates were adopted and to date have been Spayed and Neutered! This is what a little love and attention will do. 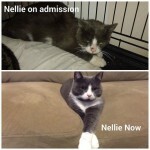 Nellie was living as a stray on the base at CFB Trenton. Very frightened at first but morphed into a very loving gentle little girl. She is now in her forever home living the good life! Earl was adopted! 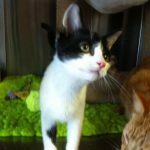 Earl came to us as a stray with zero identification. 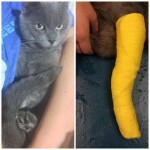 Hit by a car he sustained a fractured leg. Once leg healed Earl was adopted! 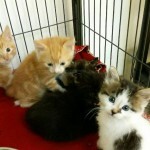 These five little cuties were left outside in a box as wee kittens. Happy to report they have now all been adopted!